Learn how to use text recruiting to attract and engage candidates, make your employer brand more responsive, improve communications throughout the candidate experience and gain the recruiting advantage of speed. Jonathan Zoob of TextRecruit provides the Rally community with a product demonstration and shares pro tips for getting candidates to respond to your texts in less than 2 minutes. Demo length: 36 minutes. 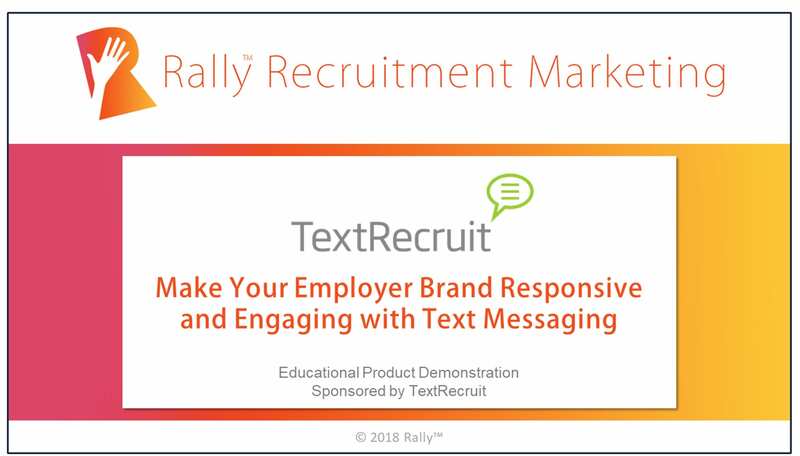 This Rally Educational Product Demo, sponsored by TextRecruit, shows how text recruiting can improve candidate communications from awareness to application, and give recruiting teams the advantage of speed. The 36 minute video features examples from Chipotle, Trilogy Health Services and Allan Myers.